Please check out our newest Digital Mixer products at: www.audiomixingplatform.com! Please Note! The PM202 is no longer in production. Information is presented here for legacy info. 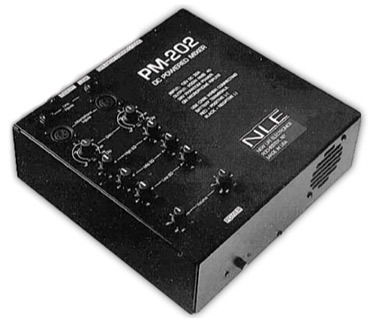 NLE has designed, produced, and marketed the PM202 - the only high-power 12V DC Powered mixer of its time. This unit features a two-channel mixer with both microphone and line-level input, and delivers well in excess of 200 Watts RMS power into a 4 ohm (typical two-speaker) load. Perfect for outdoor events such as parade floats, advertising, small bands, public-address, and more. We also carry many different lines of Professional Audio equipment. From wireless microphones to mixers to speakers, we can recommend the product that will provide the best bang-for-the-buck for your system. We service what we sell! One of the major advantages of purchasing equipment from us is that if there is a problem, we are here to make it right. If an item needs repair, we can usually provide a loaner during the repair time. Service is the reason our customers refer others to us! We take care of our customers in a way discount mail-order houses cannot. New Life Electronics Audio Division. ©2014. All Rights Reserved.